ADULT BASIC LIFE SUPPORT & FIRST AID TRAINING PROGRAM at Rojavanam Paramedical College, Nagercoil. JMT- TACT Academy for clinical Training conducted a Adult CPR and First Aid Training programme for Health Inspector students of Rojavanam Paramedical College, Nagercoil on 4.10.18 at Dr. Jeyasekharan Medical Trust Auditorium. 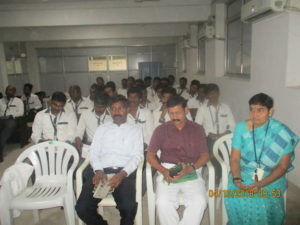 40 delegates attended the program. The Training program started with a prayer song at 9.15 am. Mrs. Jeyalakshmi, Nurse Educator & AHA BLS and ACLS instructor welcomed the gathering. Dr. Arunachalam, Professor & Mr. Arul Jothi, Vice chairman, Rojavanam Paramedical College shared information about the activities of Health Inspectors followed by Dr. Devaprasath Jeyasekharan, Managing Trustee’s message to the participants, emphasizing the importance of BLS. 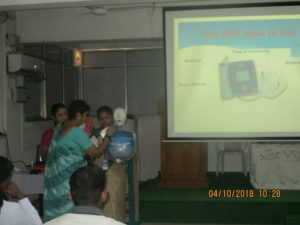 Adult BLS & AED were presented by Dr. Renu Devaprasath. She also demonstrated the use of the AED. After the theory presentation the delegates were divided into 3 groups and they underwent Adults BLS Hands-on Training on manikins under the supervision of BLS Instructors. BLS sequences were taught by the Instructors Dr. Renu Devaprasath, Mrs. Jeyalakshmi, Mrs. Lettishia and each participant had the opportunity to practice. First aid for common situations was presented by Mrs. Jeyalakashmi, AHA BLS & ACLS instructor. It was very useful and informative. The training program was successful in meeting the objectives. Certificate of Attendance was given to all the participants. Through this program the delegates were trained in BLS Skills and critical concepts of high quality CPR and use of the AED for victims, which are vital to provide good quality CPR to save lives. The registration and other arrangements were made by Mr. Nagarajan, Mr. Udhayakumar and team. The program ended at 1 pm.